Adventure Day Camp for Kids 13-15 Yrs. A week-long day camp for boys and girls 13-15 years of age full of "go play outside" fun! A leisurely paddle at dusk to follow the rise of the Harvest Moon, ending with a delicious dinner. Learn the basics of SUP (stand-up paddleboarding), a hot new sport in the paddlesports family. A 5 hour touring kayak class covering technique and rescue skills in cockpit-style kayaks. A new tradition at Shank's Mare! Forget the shopping crowds and spend the day with the family hiking the river hills. Support a worthy cause at the same time! A week-long day camp that provides campers with plenty of "go play outside" activities. Guided paddle tour on the Susquehanna followed by dinner in Shank's Mare's The Rookery. Explore a part of the Atlantic Migratory Bird Flyway located on the Susquehanna River. Guided paddle on the river and live music on our front porch. 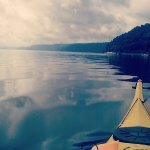 This two hour class offers an introduction to the sport of touring kayaking using decktop kayaks. A 2 hour class taught in cockpit style kayaks for those who have taken the Level I Kayak Class or comparable instruction or experience. Paddle the unique rock formations at Lock 15 on the Lower Susquehanna. Paddle to the river rocks featuring Native American rock carvings. An evening paddle followed by brick oven pizza...what could make a better hump day! A tru summertime tradition...paddle the river, summertime supper and crackin' some hardshell crabs. 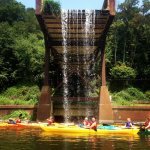 Guided paddle tour on the Susquehanna followed by a multi-course meal in Shank's Mare's The Rookery. Trace the marks of the Susquehanna Canal and explore the Conejohela Flats. Balance and core strength combines in both Yoga & SUP.